Honda EU2000i watt generator’s range of consumer products has always been impressive. But the Honda EU2000i watt generator goes to the next level and is one of the best on the market. Learn why it’s the #1 best seller for outdoor generators on Amazon. Many owners bought this generator in time to power their refrigerators and electronics in anticipation of Hurricane Irma. Some own it for recreation and others for an emergency backup. It’s reliable and very fuel efficient. If you’ve been thinking about buying a generator for your home, consider the Honda EU2000i generator. Depending on what you are powering, you can get up to 9.6 hours on 1 gallon of gas. When designing the EU2000i, Honda considered every possible application. Here’s what makes it a good purchase. When looking for a portable home generator, it’s a good idea to limit your search to inverter generators. Inverter generators produce much cleaner power than other portable generator options on the market. “Clean power” means the power is much more consistent by eliminating spikes and surges. This keeps sensitive electronic equipment, such as computers and smart TVs, safer. The last thing you want when starting your generator is for a surge to fry your expensive electronics. Be sure to put surge protectors on your equipment at all times, and you won’t have to worry with the EU2000i. Inverter generators are also much quieter, lighter and more fuel efficient. They are the best generators for so many reasons. In our uncertain times, many want a generator to prepare for an emergency situation. What’s great about this generator is you can use it in the meantime as well. It’s highly portable — just 45.6 lbs without fuel. You will likely find many opportunities to use it in addition to just-in-case scenarios. Many will want to use it for camping and RVs. Some may leave it in their vehicles for a backup, emergency power source. Portable generators are easy to take on a trip; you won’t need to lug a huge, heavy unit with you. Another benefit of this generator is you can link two identical units together using an optional kit. When you link two Honda EU2000i generators together, you increase your overall power output by nearly double. This is an obvious advantage, but it goes beyond just doubling your power. If there comes a time when you need more power, you won’t have to buy a new, bigger unit. All you need to do is buy a second Honda EU2000i and the parallel kit. There is also a Honda EU2000i combo set on Amazon that comes with two generators and the adapters. The kit comes with everything you need to maximize the power of both units together, whether it be for enjoyment or out of necessity. For anyone who enjoys outdoor recreation, lives in an extreme climate or a hurricane zone, or is dependent on an electrically-powered medical device, a 2-generator combo pack could be a huge help. The Honda EU2000i features a single DC outlet and two AC outlets. The overall output of the Honda 2,000-watt EU2000i generator won’t be enough to power your entire home in emergencies but that’s not what it’s built for. If you are looking for a more powerful generator, there are others to consider. This generator will, however, provide you with plenty of power to keep your most essential appliances running without pause. If you’re looking for more power, you could opt for the Honda EU3000iS which will give you 3,000 watts of power. Or you can purchase a second EU2000i and run them together with a customized kit. This will double your output to about 4,000 watts. With the Honda EU2000i, we all need to watch the surge current on the eu series. One thing I found is the idle screw is not set right from the factory on my Honda generator. The idle was set too low by specification by the factory. What the result I experienced was that it messes with the recovery of the speed control time and current demand. In other words if the idle speed is set according to specifications, or 50-100 rpm above spec, it will recover ok to an 50 amp draw on 125 volts AC, but if the fridge is an older one it can draw as high as 100-125 amps. I know my old 1985 fridge did. The newer refrigerators of today is only 10 amps draw on startup and drops back to 1.5 amps running. Newer freezers are even better 4.5amp draw on startup and 1.1amps running. It has to do with the compressors starting up. The newer units free wheel the compressor until it is full speed then the valve to the refrigerant to the system. If and when the power drops out it resets to the free wheel, so not much of a rotor lock. One of the main limitations of any generator is how long it’ll keep going on a single tank of fuel. The Honda Generator EU2000i will keep running for about 4 hours consecutively with a full tank, running at full load capacity. If you run it at 25% load capacity, it’ll keep running for nine or more hours. These time limitations can be eliminated with the addition of an external fuel tank. One that comes highly recommended for the Honda EU2000i generator is the BERG system from IPI Industries. This awesome unit extends the run-time at full load by up to 72 hours. They even manufacture a dual-feed version that supplies two EU2000i’s running in parallel. When choosing a generator, the noise level it produces (or doesn’t produce) is normally a high priority. Also, it’s illegal to exceed 70 decibels in residential areas. The EU2000i operates at a comfortable range between 53 and 59 decibels. This falls within the range of a normal conversation. Simply stated, this means that it is between 10 – 100 quieter than a generator rated at 70 decibels. When you’re running the Honda EU2000i at your home or campsite, the noise is easily hidden by background noise. Honda uses superior technology and quality construction to help make it one of the quietest generators on the market. If you’re looking for a quiet generator, the Honda EU2000i should be your top choice. Like anything that’s powered by an engine, there’ll be some essential maintenance requirements that you will need to do. One of these Honda EU2000i magnetic dipstick and drain plug (find them here) to change the oil. A great feature of the Honda EU2000 watt generator is that it will automatically power itself down when it detects an oil level that’s too low. Perform easy, light maintenance, and it will serve you well. The good news is it’s easy to service this generator. You won’t need any special tools. You will be able to easily access the parts to clean. Honda has a wonderful reputation for reliability with their products. The 2000 generator boasts a full 3-year warranty from the date of purchase. There are a lot of similar-output generators on the market from other manufacturers. Some of the closest competitors you’ve probably seen are the Yamaha EF2000iS and the Generac iQ2000. Honda generators tend to be much more reliable and have more advanced features than their competition. You can also count on a great efficiency level and a cleaner output signal from the EU2000i. A Honda will run longer and be much quieter. Most people don’t even know it’s possible, but you can actually run an EU2000i on natural gas or liquid propane. This is done through a simple adapter kit. When you install the adapter kit, you’ll be able to run the unit on natural gas, liquid propane or gasoline. The tri-fuel adaptors work by mixing the natural gas or propane into the airstream prior to reaching the carburetor. As such, you’re not making any modifications to the mechanics of your generator. How many times have you left a dome light on overnight and woke up to a dead car battery? Or, in the cold of winter, you wake up to a vehicle that won’t start? Instead of jump-starting your vehicle with another (which sometimes isn’t possible), you can use the EU2000i to charge your car battery and get going again. This generator features a 12V DC output that works great for getting the power back into your car battery. It does require you to purchase an optional charging cable to take advantage of this feature. Everybody’s paying attention to emissions these days, due to the threat of pollution and reported global warming. CARB (the California Air Resource Board) sets strict limits on emissions. The EU2000i falls well within these limits and is fully CARB compliant. In the aftermath of Hurricane Harvey and Hurricane Irma, thousands of Americans living along the coast are buying generators to be prepared for the next time something happens. 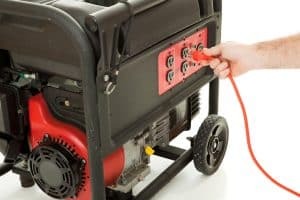 Once considered a bit of a luxury for the average homeowner, many now consider a generator a necessity to power freezers, fans, smart phones, and critical medical equipment during emergencies. In fact, as the recent hurricanes approached, local stores in Texas and Florida were reporting sales of over 20-30 generators in an hour, with some folks purchasing two at a time. What’s great about this generator is you can use it in the meantime in many different ways. An inverter generator uses advanced technology to produce clean power. These generators are quiet, energy efficient, and portable. Because it uses technology from both an inverter and a traditional generator, it is called an inverter generator. These generators use magnets and special electric circuitry to convert power in three steps. First, it outputs power in the form of AC current, similar to most traditional generators. Next, the AC current is converted to a DC current. Finally, the DC current is then inverted to clean AC at the correct voltage and frequency. The following are reasons why these generators are so popular. These generators produce power that is as reliable as line power. This is especially nice for powering your smaller devices like phone chargers and desk lamps. Traditional generators, on the other hand, produce raw power that is best suited for powering large electrical systems like central air conditioning. The inverter generator small is small and lightweight, making it easily portable. Despite its small size, the unit is very efficient. People bring it camping and in RVs. Traditional generators are bulky and a hassle to move. They have their uses of course, though you wouldn’t think to carry one along on a fishing trip. This type of generator automatically adjusts the engine acceleration to produce only the needed power output. This makes for a smaller gas tank, lower fuel costs, and lower emissions. Traditional generators run at 3,600 rpm and at a frequency of 60 Hertz per cycle. The inverter generator runs at a lower rpm while maintaining the correct frequency for the load at hand. Because the engine never runs at full speed, they work quietly compared to traditional generators. The volume is supposed to be equal to human conversation. This makes taking a generator along on a trip more appealing because you can use it, literally, without the headache. For home use during a power outage, it won’t bother your neighbors. An inverter generator can be coupled with another one when you need more power. You can use multiple generators to do the work of a larger, bulkier traditional generator. Honda offers this double generator with companion kit, which combines two of their most popular generators for up to 4000 watts of combined power. This pairing gives you more power without reducing portability. Depending on your need, take along one unit or both. Each generator will work independently. The Companion model has a 30-amp receptacle that allows you to draw the maximum amount of power out of the two generators when paired. The super quiet Honda 2000 Inverter Generator is one of the most popular models of portable generators. The kit comes with Honda parallel cables to link the generators. The kit also includes extension cords and covers. Honda is one of the best generator manufacturers and often outperforms the competition. Any small business that could suffer loss due to power failure could benefit from a portable inverter generator. Such businesses include those that provide internet-based services or any type of private patient care. And of course, any food services like restaurants and small markets are surely in need of backup power. You could lose costly inventory without backup power available. Most people think of storms or natural events like earthquakes causes for power outages. For those living in severe climates, however, even a brief power outage could be harmful, if not deadly. The double generator could run a furnace or power an air conditioner. The elderly are especially vulnerable. Any of your outdoor activities can include a few amenities with a small generator, such as lights, a coffee maker, an electronic bug zapper, or any other small device for those who prefer to supplement nature with a few luxuries from home. Contractors often need a power source for their tools, spray guns, or compressors. For smaller jobs, one of the Honda generators is ideal. For those longer jobs where no electricity is available, you can double up with the companion generator. We’ve done a ton of research and found the Honda EU2000i stands in a league all its own. With all the features, benefits, reliability and stability it’ll provide you, you will be glad you own it. Especially in times of power outages, extreme weather, and more. A quality generator can protect you and your family if the grid goes down. The Honda Generator EU2000i is the definition of quality.